I have collected a few warbands to be used with the Of Gods and Mortals (OGAM) rules. 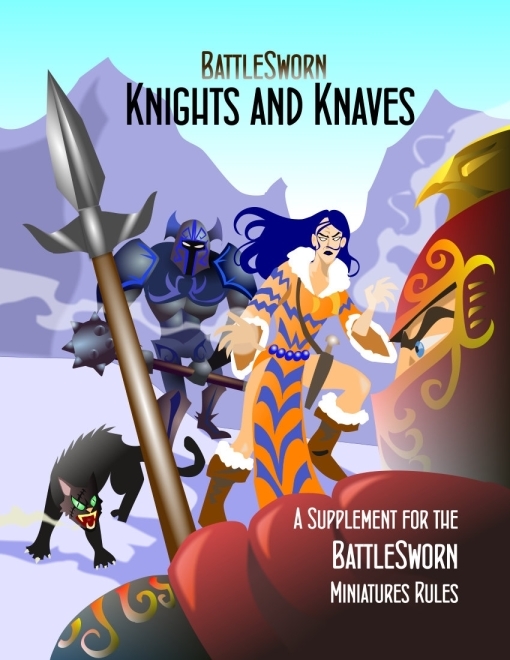 However, with the extra character classes provided in the Knights and Knaves (KnK), it looks like they can be used in a good thematic game of mythological Battlesworn. So, I had a game with my son Steven, who used a Greek force, whereas I ended up with an Egyptian force. Unlike OGAM, there are no gods, but there is plenty of scope for legendary characters and monsters to mix in with normal humans. Below is the Greek roster. From left to right are: 4 x Greek warriors (Fighter), 3 x Spartans (Tanks), 1 x Medusa (Warmage with Paralysis spell), 1 x Minotaur (Berserker/Brute), and 1x Bronze Bull Automaton (Giant/Construct). The giant class seemed a good fit for the automaton, the knock back ability looked right with the big horns flinging opponents away. A total of 10 figures for the 12 slots. Next is the Egyptian roster. From left to right are: 4 x re-animated Anubians (Fighter), 2 x Egyptian slingers (Shooter), 1 x Goatman (Berserker), 1 x Goat (Beast), 1 x Sobekian Crocodile (Tank/Brute), 1 x large Scorpion (Assassin/Tank). A total of 10 figures for the 12 slots. As it transpired, the automaton was near the scorpion, which was fortuitous for the Greeks as it had immunity to poison. 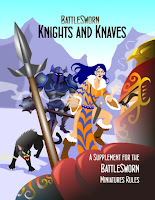 With a few crazies about (berserkers and beasts), it wasn't long before combats happened. With the Greeks winning initiative, the automaton did indeed charge the scorpion, who, striking first, hit the scorpion who was hurled back out of the terrain. The scorpion did not even get a chance to strike back as it had bid higher. 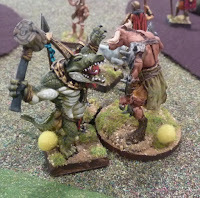 The other dramatic fight was a clash of the two other multiclassers - the Minotaur up against the crocodile. The crocodile bid 5 in the first melee, whereas the Minotaur bid 6. Striking first, the crocodile did 2 wounds. 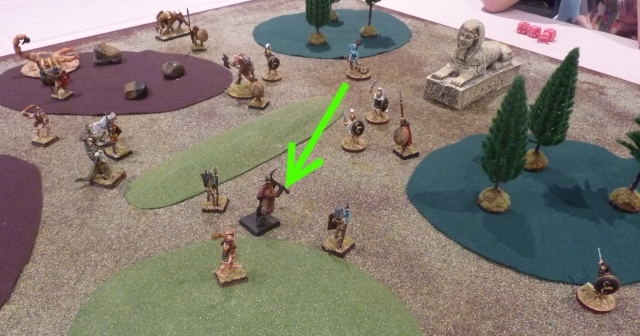 So when it was the Minotaur's turn, he attacked with 8 dice (bid of 6 plus bonus of 2 for wounding). Luckily for the crocodile, he survived with only 2 wounds himself. At one point, an anubian fighter joined in to break the deadlock, but the minotaur who was on condition red bidding 6, rolled 9 dice for 6 wounds on the hapless fighter. This was a real titanic fight that lasted the length of the game when the crocodile won in the last turn. The game took 8 turns, with a win to the Egyptians. There was only one drawn initiative bid, and using the escalation rule, more models were moved into contact. There were no "turtling tactics" in this game, every model was fighting by the last turn except one, which probably explains the early finish. Overall, the KnK classes blended in nicely and added a bit more storytelling to the game. "As it transpired, the automaton was near the scorpion, which was fortuitous for the Greeks as it had immunity to poison"
It did? How? It's a Giant/Tank. Are either of those classes immune to poison?